Using the Pomodoro LE iPhone app, I work in 25 minute increments followed by 5 minutes of break time, after the fourth repetition I get 30 minutes of break time. I only let myself check my social media pages during break, if something extracurricular comes up that is related to work I let myself do that too. First day I did 10 Pommies, as I like to call them, second day was 11 – today I’m going for 8 or 9 just because it’s been a bit intense. 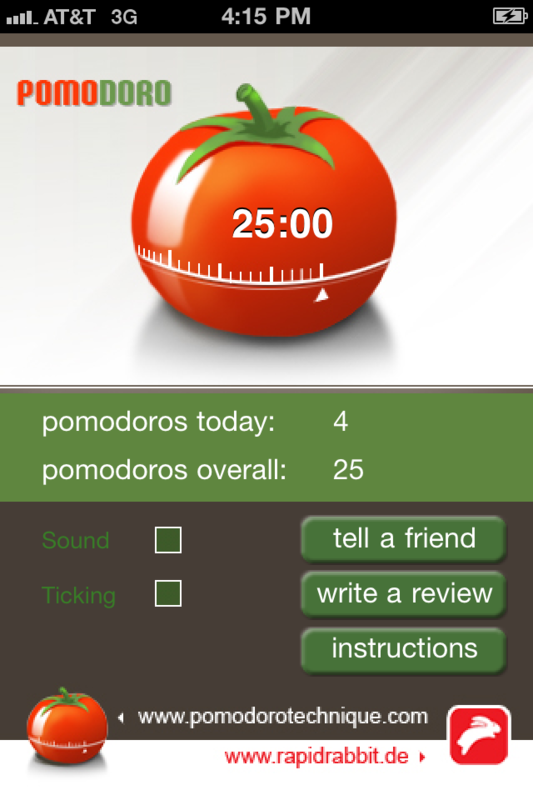 Tap the tomato to start and Pomodoro LE keeps track of Pomodoros Per Day & To Date.